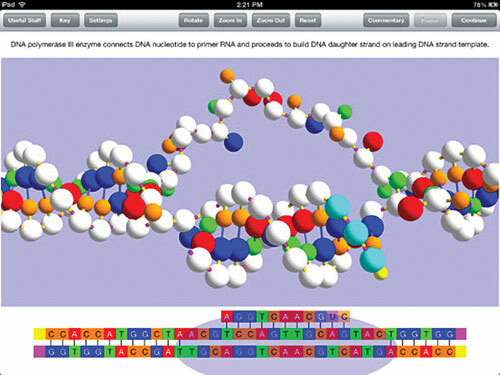 In recent months I’ve highlighted two excellent iPad apps by OnScreen Science that center around a 3D model of DNA. For the sake of completeness, let me now mention the third and final member of the trio: OnScreen DNA Replication. Using the same excellent 3D DNA model (which can be manipulated and resized with your touchscreen), this app walks users through the process of DNA replication. The “useful stuff” section contains text descriptions of pertinent enzymes and other aspects of DNA replication such as leading and lagging strands and Okazaki fragments. Due to the complexity of the process, the simulation is a bit difficult to follow; however, credit must be given to the attention to detail. Just like the other apps by this developer, the OnScreen DNA Replication app is incredibly educational and fun to use.